The EPIA CL has 2 Network Interfaces on board, making it ideal for use as a basic Two-Interface Firewall, in combination with an ADSL or Cable Modem. The idea is that all internet traffic is piped through one NIC and into the EPIA CL, and allowed through the other NIC onto the local network only if the firewall allows it. We'll also be allocating IP addresses with a DHCP server, sharing our internet connection with other machines and running a local DNS server to resolve domain names. The OS chosen will of course be Linux - all of these features are available out of the box. We chose Shorewall to configure the firewall built into the Linux kernel. 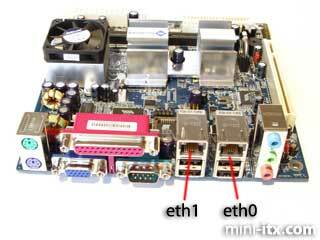 This guide will also apply to any EPIA with an additional NIC on a PCI card. The advantage of using the EPIA CL is the PCI slot is kept free, and a smaller enclosure can be chosen - our fanless EPIA CL 6000 fits into a wee Cubid 3688 case and runs in near silence. We chose Redhat 9 as our Linux distribution, but this guide should work with other distributions. We installed from CD, choosing a "Custom" install - we made sure we installed a web browser and at least the following servers: BIND, DHCP, DNS, and SSH. We tried to keep GUI-based tools to a minimum, though we will change the run level of our system to remove the GUI (and save memory) as a last step in our project. This is a basic Two-Interface Firewall configuration. The Redhat installer allows you to assign an IP address to each network interface, or have it assigned automatically from a DHCP server. 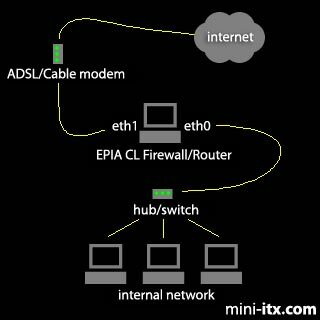 Our ADSL modem (a D-Link DSL-300G+) has a built-in DHCP server which will assign an IP address for eth1 - so we chose "assign by DHCP" for eth1. We assigned 192.168.1.1 as the fixed IP address of eth0, with a subnet mask of 255.255.255.0 - do not enter a gateway address. The DSL-300G+ is an inexpensive "always on" ADSL modem with an ethernet port but no firewall features - ideal for our purposes. If we had cable, we would have used a similar cable modem. We connected the modem and EPIA CL together at eth1 (see above picture). We connected to the modem by web browser using its preset IP (http://192.168.0.1 for ours) and entered the username and password for our ISP. In the UK, we have PPPoA encapsulation and CHAPS authentication. Then we connected up to our ADSL socket and reset the modem. A flickering ADSL LED showed we had connected to our ISP. The rest of the install was conducted in glorious text mode. We only had Windows PCs on our network, so we downloaded PuTTY (a secure shell client) and connected to the EPIA CL using the IP we assigned to eth0. We logged in using the username and password we chose in the install process, and then switched to root using the su - command. ...where 56.78.90.12 is the IP address of our ISP's primary DNS server. We chose Shorewall, a high-level tool for configuring the Linux 2.4/2.5 firewall subsystem included in the standard Linux kernel. ...where the actual URL is of the most recent shorewall tarball (tgz). These are the most basic options. Shorewall is capable of much more, but that is beyond the scope of this project. We checked our changes using shorewall check. Shorewall won't start until we remove the startup_disabled file - rm /etc/shorewall/startup_disabled - then we can type shorewall start. Our firewall won't dish out IP addresses or resolve URLs yet, but we can still test it is routing traffic on another machine. We assigned an IP address to a local machine (e.g. 192.168.1.50), with a gateway of 192.168.1.1 (our EPIA CL) and used our ISP's name servers as the defaults. This configuration allocates IP addresses in the range 192.168.1.100 to 120. The command service dhcpd start starts the server. We tested this on a Windows box using ipconfig /renew - this should pick up a new IP from the DHCP server (make sure the box is set to obtain an IP address automatically). 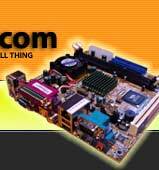 We chose the domain "ourdomain.com" to describe our internal network - but you can put anything you like here. If you own a domain, you could map machines on your network to subnets of this. Don't forget the "." after each name. The last two lines in our zone file define the host name to IP address translation for our local machines. We started the DNS server with service named start. With our name server in place we should be able to connect any machine to the network, have the firewall allocate an IP address, and start surfing. Our memory usage with a GUI was 190MB (top -d 3, then when you are done, q to give you your prompt back). After restarting (shutdown -r now) this was reduced to just 50MB - and this wasn't even a particularly optimised system. If something isn't working, type tail -f /var/log/messages to view error messages in real time, then connect to the machine on another session, run the offending command again and monitor the output.